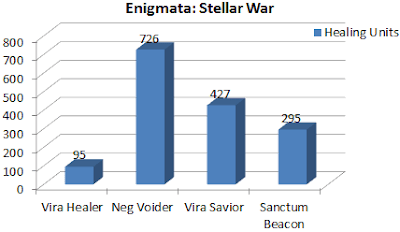 Start with a base, which you protect from an ever increasing onslaught with various towers. 1) Offense is the Best defense. 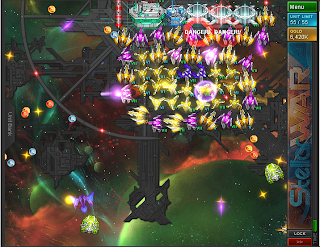 Build as many units as possible with only limited front line defensive units. 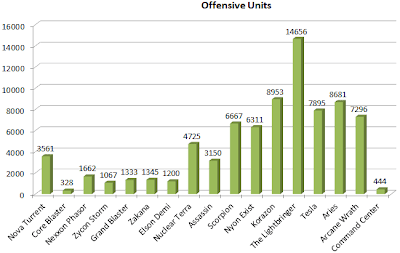 2) Avoid spending $ for unit upgrades for early units, except defensive units. as you will delete these units as better units become available. 3) Be sure to visit the Achievement Screen and use upgrades wisely. 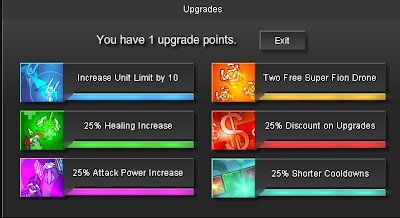 4) Use Upgrade points (Achievement Screen) to first increase unit limit, then attack power increase, then shorter cooldowns, then discount on upgrades, finally drones. *Healing Upgrades (Upgrades Screen) do not seem to increase unit healing. NB: Damage is a total number and spread over all rounds. So Korazon may do more damage at Level VII, than Nyon Exist but it is spread over three rounds, so if two rounds miss, you have only 1/3 the damage. est. Healing/minute 0 ?? ?? A guide is here, but you have to scroll down the page.